This is an adaptation from a fantastic Thai chef called Pai, (Pailin “Pai” Chongchitnant) . 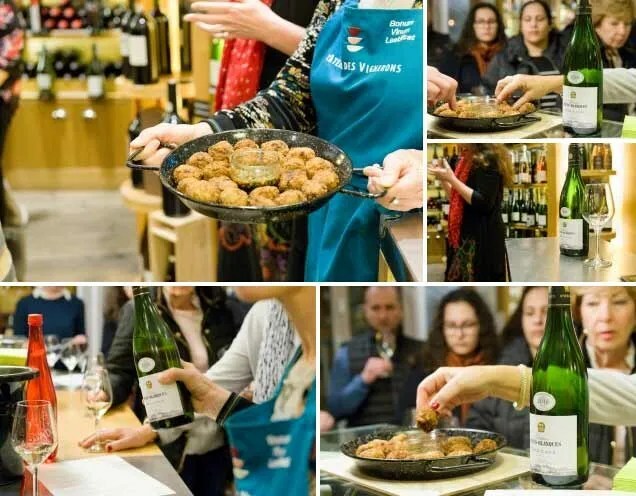 She very kindly gave me advice on how to tweak her recipe so that it would work for the tasting at L’Atelier des Vignerons’ Wine and Spice Tasting that I held last Friday. I had two issues to contend with, firstly the cost of doing 100% prawns in France for a tasting that was only 15€ a head was going to be prohibitively expensive. Secondly the only heating facilities I had was an electric hot plate which at best would get things tiède/warm! So below is my version of Pai’s Shrimp Cakes. Makes roughly 46 balls the size of a Reine Claude plum! First reduce the coconut milk, pour into a wide pan and bring to the boil then reduce and simmer until thickened. Add the curry paste, stir and continue to reduce until all the liquid has evaporated. I found that this took a good 15 – 20 minutes as I was making a much larger quantity than Pai. Put to the side and cool completely. This is a good time to make the dipping sauce. In a pestle and mortar pound together the garlic and ginger and add to a pan with the sugar and vinegar. Cook over a medium heat until thickened, roughly 5 minutes. Set aside to cool, it will continue to thicken. Then adjust to taste with soy sauce, ginger, fresh lime juice, coriander and peanuts. Back to the fishcakes. In a large bowl add the cooled paste, kaffir leaves, fish paste, beans and sugar. Mix well. In a food processor add the fish, cut into rough cubes, be sure to remove any bones, the defrosted and dried prawns and eggs. Blitz until fine. Add to the other ingredients and thoroughly mix, I found this best done with a bendy spatula. I then heated a small amount of vegetable oil in a frying pan and fried a teaspoons worth of the mix to gauge the chilli and seasoning content. Adjust if necessary, adding more fish sauce and curry paste. Put into the fridge to cool and firm up whilst you prepare your work surface for making the balls and frying. In a wide bowl mix the breadcrumbs and polenta (Pai, like most chefs, recommends Panko breadcrumbs, however whilst I understand the reasoning for these crumbs I have always found it crazy to pay for breadcrumbs when, especially in France, we normally always have left over bread somewhere! However you do need to make sure it is very fine, and to get that crunchy texture of Panko I mix with some fine semoule/polenta as well). Prepare another bowl with cold water for rinsing your hands as you go as this is messy work! If you want to cook this straight away then you will need to also prepare your frying equipment, deep fat fryer with vegetable oil (at least 2.5cm deep), kitchen towels to drain them on, and a platter to serve. However I made mine a day ahead as this was just one of five dishes that I was making, and found that a night in the fridge helped firm them up which ensured that they kept their shape when frying. So in that case prepare two baking trays with baking parchment to place the balls onto. Now the fun part!! Put your oven onto warm. Then wet your clean hands, take a dessert spoon worth of fish mixture, gently form into a ball shape and drop into the crumbs. Do four or five at a time, then cover the balls with the crumbs. You will find that the ball shape is much easier to achieve when covered in breadcrumbs. Pop onto the baking sheet if chilling first, cover and refrigerate. To deep fry, heat the oil to 180°C or until a piece of bread rises sizzling to the top when dropped in. Depending on the size of your pan fry five or six at a time, don’t over crowd as you want to be able to turn them easily. They are ready when a nice golden colour. Pop into the warmed oven whilst you continue with the rest until they are all cooked. Serve with the dipping sauce. a beautifully crisp white wine from the Limoux hills of Cépie. Showing notes of green apple and citrus fruits. The aromatic profile of the wine perfectly partnered the aromatic spices of the Thai fish cakes. If you are using dry red chilies soak these first in hot water, for fresh chilies chop roughly. Depending on the heat that you are after you can remove or include the pith and seeds! Put all of the ingredients into a small food processor and blitz until a smooth paste. If you are feeling traditional, you can pound by hand using a pestle and mortar, I confess I didn’t!! Because I used fresh chilies I found that my paste was not as “red” coloured as the bought stuff, but the taste was definitely superior. Any extra keeps in the fridge for three weeks.